Although we've had robots — machines programmable to perform human-like functions — since 400 BCE, we only got the word robot in 1920, thanks to a Czech playwright. It's taken a long time for actual robot technology to even approach the potential imagined in the stories we've been telling about robots from this planet and others. Translating these creations to stage and screen have yielded some truly regrettable robots, some of which are beyond even the reach of Gloom in Space to describe. Let's run down the top five saddest robots from movies and TV. 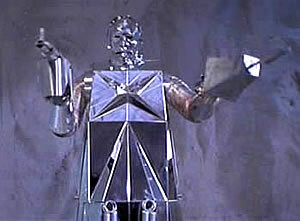 1) Ro-Man Extension XJ-2 from Robot Monster: This robot, like many, is just a guy in a suit. That suit, though, wasn't made of metal hardware. Instead, Ro-Man wears a gorilla suit and a Sputnik-like astronaut costume helmet. He's bent on wiping out the last eight members of the human race. He doesn't succeed. 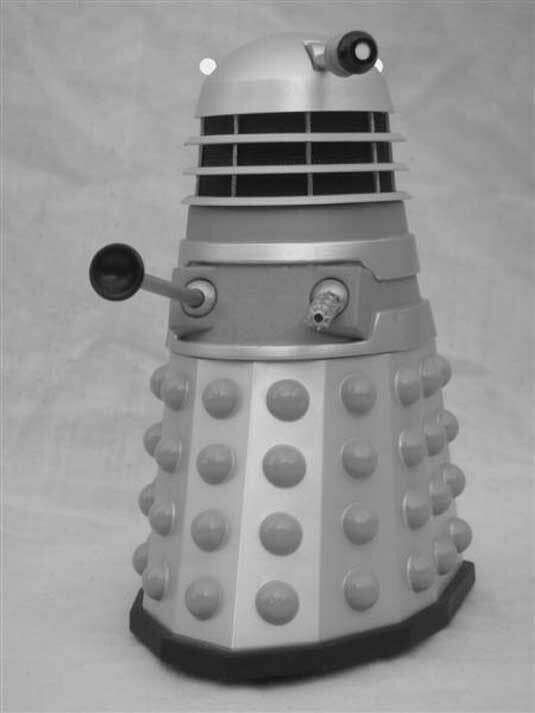 2) Daleks from Doctor Who: These robots are the scariest foes for the Doctor, but it's hard for viewers to understand the terror they inspire when a Dalek is an upside-down trashcan on wheels, with egg beaters and a toilet plunger as weapons. All the earliest Doctors needed to do to foil these villains was to go up a flight of stairs. 3) Nomad from Star Trek: The Original Series: A junkyard is a set designer's best friend, and Nomad looks like it was assembled straight from the trash heap. With a head like a coffee percolator and a body like a mesh office wastebasket, it's hardly a worthy adversary for Captain Kirk. 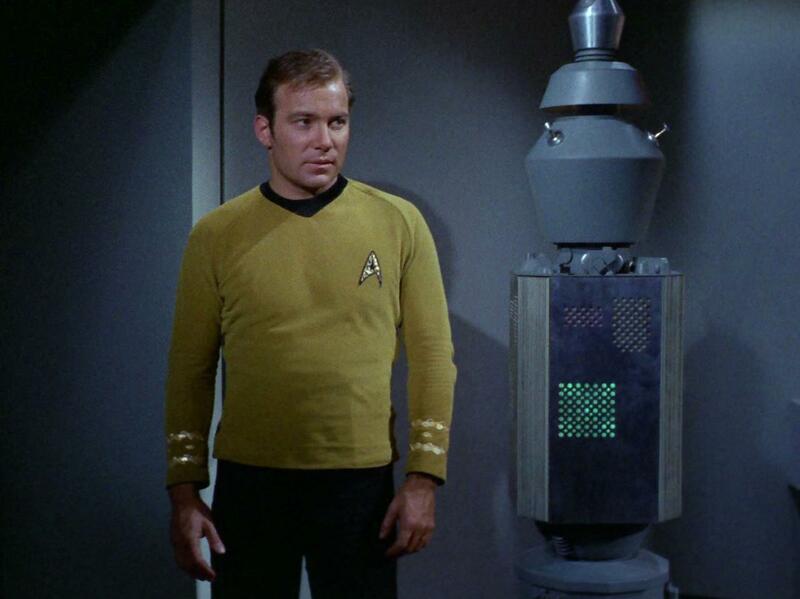 Indeed, Kirk shuts down this mechanical menace by convincing it to commit suicide. 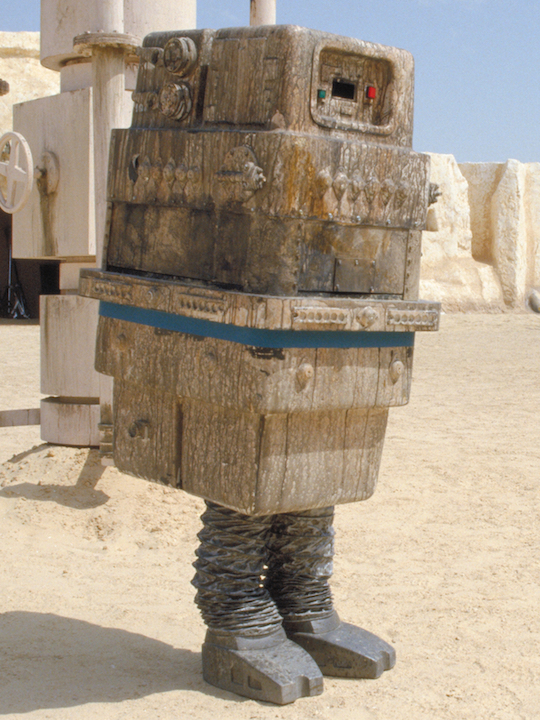 4) Power Droid from Star Wars: This sad excuse for a robot was especially pathetic next to shiny, elaborate droids like C3P0 and R2-D2. Borrowing from the well-established tradition of trashcans as costumes, the Power Droid is just a box around a child or little person. Some flexible plastic ductwork gives them leg warmers to go with flat metal boxes for shoes. And still they managed to make two action figures out of this guy. 5) Box from Logan's Run: As shiny as this robot is, all that chrome isn't enough to distract viewers from its janky design. The actor's head is wrapped in something like a reflective space blanket, with a slot cut for the mouth. The body looks like a shiny rooftop industrial air conditioner. While it has metal ductwork to cover the arms, it looks as though the actor is holding sticks with heavy, boxy guns on the ends, leaving them to flop around randomly. Don't go there with them Daleks, bud, the scariest race in the Whoverse! Also, the Daleks AREN'T robots - there's a living, organic, evil being in there!